Ankita Lokhande looks gorgeous and attractive in a red sequins dress. She was there to celebrate her own 34th birthday. She is all set to release her big Bollywood debut Manikarnika: The Queen on Jhansi. We can see that her birthday bash included Manikarnika team as well. After the launch of the Manikarnika trailer, Ankita threw a birthday bash. Ankita's Manikarnika co-star Kangana Ranaut arrived at the party, dressed in a shimmery tulle dress. The guest list for the party was majorly dominated by Ankita's close friends from the television industry. Ankita celebrated her birthday yesterday and her Manikarnika co-star Kangana Ranaut came to with her. Ankita proudly shows her cake. In the pic, Kangana can be seen feeding cake to Ankita. 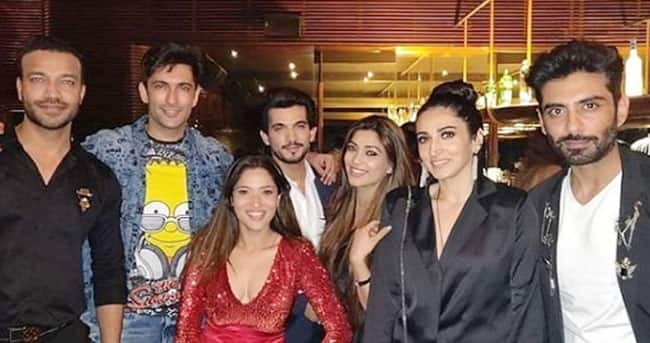 Celebrations included her bestie Mouni Roy, TV actress Sanjeeda Shaikh, casting director Mukesh Chhabra and fashion designer Neeta Lulla among others. While Prince Narula decided to don an all-black outfit for the night, Yuvika Chaudhary looked pretty in that shimmer dress. It was a double celebration for Ankita Lokhande. Since it was the actor’s birthday as well. After the launch of the trailer, Ankita threw a birthday bash where her rumoured boyfriend Vicky Jain was also spotted. In the pictures, her rumoured boyfriend Vicky was also seen posing for the camera. Ankita Lokhande and Usha Nadkarni at loggerheads?